At approximately 8:30am today, the National Weather Service sent a test tsunami warning to an unknown number of people. 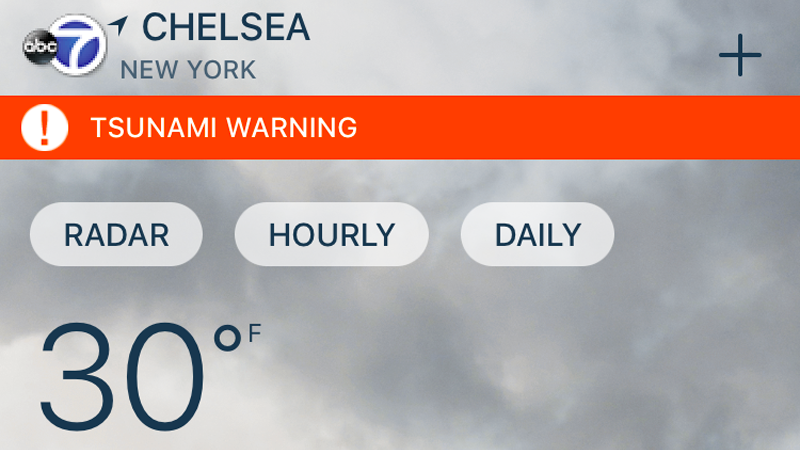 It was not immediately obvious to some that the alert of an impending, destructive force of nature was a test—and at least one-third party app, AccuWeather, reportedly pushed it out as a genuine alert in multiple states. All morning, local NWS Twitter accounts have been trying to reduce the confusion their alert—in conjunction with the genuine panic caused by erroneous warnings from AccuWeather—has caused. Accuweather itself has restated that the NWS alert was a test, but has not clarified why it was not sent out as such by its mobile app. For what it’s worth, Tsunami.gov currently shows two earthquakes on the entire planet, and both are more than two points shy of the 7.5 magnitude usually required to cause a tsunami. Historically, tsunamis almost never hit the East Coast of the US. This widespread piece of misinformation follows a false missile attack warning sent to residents of Hawaii last month, and precedes a congressional hearing “on the effectiveness of the emergency alert system” scheduled for 10am this morning. Correction: an earlier version of this post stated that the earthquakes appearing on tsunami.org were measured by the Richter magnitude scale. Moment magnitude is the scale most used by seismologists.